1. Kuhn Rikon Auto Safety Master Opener: This can opener is so easy to use. What I really like about it is that the lids come off without the jagged edges, so it's also very safe. I may not be a newbie in the kitchen, but I can be clumsy. Anything that gives me less of a chance of cutting myself, I'll gladly take. 2. Egg Yolk Separator: This is definitely one of those tools you don't realize you need until you actually have it, use it, and recognize that it just cut out a few minutes (plus a potential egg-y mess) in the cooking process—especially if you're baking something with a lot of egg whites! Our separator also attaches to any bowl/cup for extra ease. (NOTE: I couldn't find the exact one we own, however the one I linked to looks, and functions, very similarly). 3. Egg Rite Egg Timer: I like to make a perfect soft-boiled egg, which is made infinitely easier with an egg timer. All you do is drop it into the pot with the eggs and watch it change colors as the water boils. Get it, and never overcook those yolks again. 4. OXO 2 Cup Adjustable Measuring Cup: I don't know about you, but I always get irritated whenever I need to measure substances with sticky consistencies for recipes, e.g. sour cream, honey, almond butter, etc. This measuring cup makes the process so much easier! The inside cup acts almost like a squeegee, pushing all of the contents out into your mixing bowl. 5. OXO Good Grips 3-in-1 Avocado Slicer: As you saw in a previous post, I like my avocados. However, they can also be pretty annoying to prep. This tool can be used to cut open the avocado, pit it, and slice it. It's especially handy when using multiple avocados to make, let's say...guacamole. 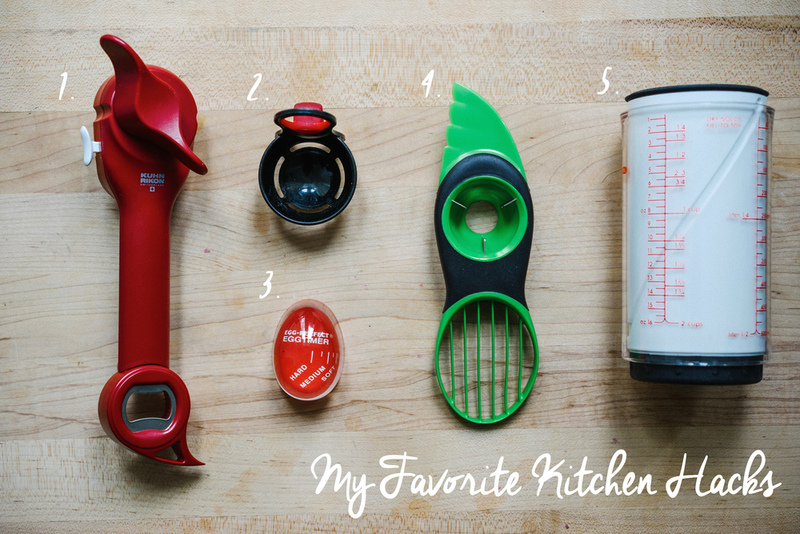 I'd love to hear about any kitchen gadgets you use to make life easier. Share 'em in the comments below!